Download "! encor en etworks TM"
2 Page 2 PCM Voice Network, Document 4 2 Then, still on the Main Menu, select Typical Configurations. The Typical Configurations menu is displayed. Typical Configurations Menu ) System Configuration 2) IP Interfaces 3) IP Static Routes 4) VPN Profiles 5) IP/VPN Policies 6) NAT Profiles 7) DNS/DHCP Servers 8) Configure Firewall 9) IP QoS (Quality of Service) A) GPS Geo-Fencing L) LAN : EtherNet No DHCP ETHERNET W) WAN : EtherNet No DHCP ETHERNET M) MODEM : Point-to-Point MODEM INTERNAL S) SERIAL : Frame Relay SERIAL V.24/RS232 DCE E) EXPANSION : Frame Relay EXPANSION EnDual T1/E1 B) RDU/IDU Ports... P) More Ports... Enter Choice : E 1 On the Typical Configurations Menu, select the Expansion port. The Expansion port s Logical Port Attribute Menu is displayed. 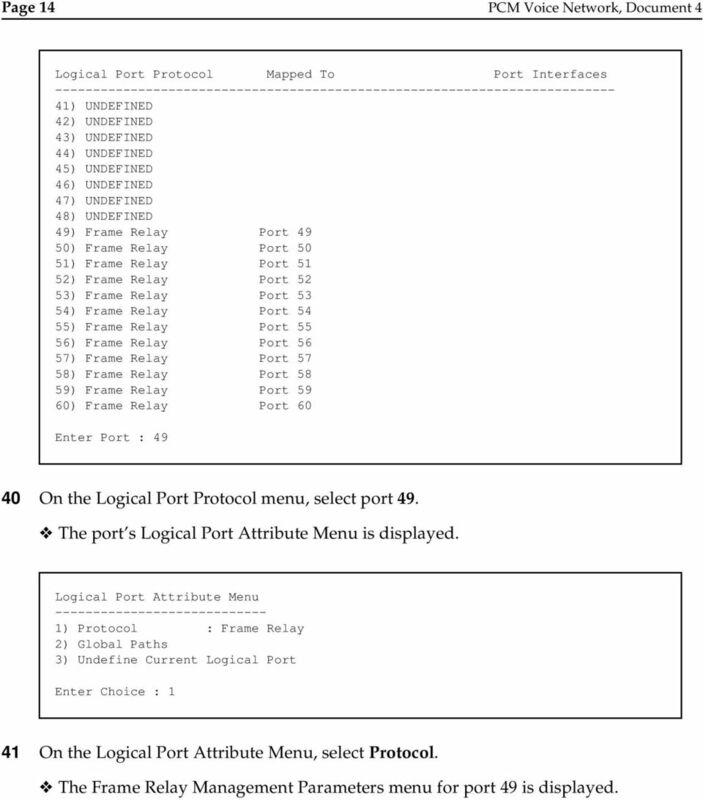 Logical Port Attribute Menu ) Protocol : Frame Relay 2) Global Paths 3) Undefine Current Logical Port Enter Choice : 3 2 On the Logical Port Attribute Menu, select Undefine Current Logical Port. The Logical Port Attribute Menu is redisplayed, with no protocol defined. Logical Port Attribute Menu ) Protocol : UNDEFINED 2) Global Paths 3) Undefine Current Logical Port Enter Choice : 1 3 On the Logical Port Attribute Menu, now select Protocol. The Logical Port Protocol Selection Menu is displayed. 3 Configuring the BANDIT III s T1 E1 Card for a PCM Voice Network Page 3 Logical Port Protocol Selection Menu ) Frame Relay 2) Point-to-Point (PPP) 3) MultiLink PPP 4) X.25+ 5) SDLC Routing 6) SDLC 1490 Configuration 7) Byte Sync Encapsulation 8) ALC 9) Bit Sync Encapsulation A) Sync Burroughs Poll/Select B) Bisync C) X.42 Spoofing D) Diagnostic Async E) CDC F) Voice/PCM Encapsulation Enter Choice : F 4 On the Logical Port Protocol Selection Menu, select Voice/PCM Encapsulation. The following prompt is displayed. Please enter the number of channels to configure,: PCM/VOICE 5 To configure all 24 T1 channels, type 24 and press Enter. The Expansion port s PCM Parameters menu is displayed. PCM Parameters : EXPANSION ) GPT Names 2) Priority : Immediate Enter Choice : 6 It is not necessary to change anything on the PCM Parameters menu. Press Escape until you reach the Main Menu. 4 Page 4 PCM Voice Network, Document 4 Main Menu ) QuickStart Config Builder 2) Typical Configurations 3) Advanced Configurations 4) Tools V) View Current Unit Status F) Cellular Fast Connect L) Load Factory Defaults P) Load Plug and Play Defaults W) Write Configuration R) Reset Unit X) exit Session S) Statistics Y) system Administration Enter Choice : 3 7 On the Main Menu, select Advanced Configurations. The Advanced Configurations menu is displayed. Advanced Configurations ) Physical Configurations 2) Data Configurations 3) Local Address 4) Routing 5) Global Paths Enter Choice : 1 8 On the Advanced Configurations menu, select Physical Configurations. The menu of Port Interfaces is displayed. Port Interfaces M) MODEM : INTERNAL S) SERIAL : V.24/RS232 DCE E) EXPANSION : EnDual T1/E1 1) RDU/IDU Ports... : Enter Choice : E 9 On the menu of Port Interfaces, select the Expansion port. The Expansion port s Physical Parameters menu is displayed. 5 Configuring the BANDIT III s T1 E1 Card for a PCM Voice Network Page 5 Physical Parameters : EXPANSION ) Dual Port T1/E1 Configuration Enter Choice : 1 10 On the Physical Parameters menu, select Dual Port T1/E1 Configuration. The Dual Port T1/E1 CSU/DSU Configuration menu is displayed. Dual port T1/E1 CSU/DSU Configuration ) Subport 1 2) Subport 2 3) Clocking : Internal 4) Timeslots : 1-24 (Read only) 5) E1/T1 Port Type : T1 6) Channel Mode : Channelized 7) Channel Data Rate 8) Buffer Length : 0 9) Queue Depth : 0 A) Dual port T1/E1 Cross-connect Configuration B) Voice Config Enter Choice : 3 11 Now you can change the clock source. 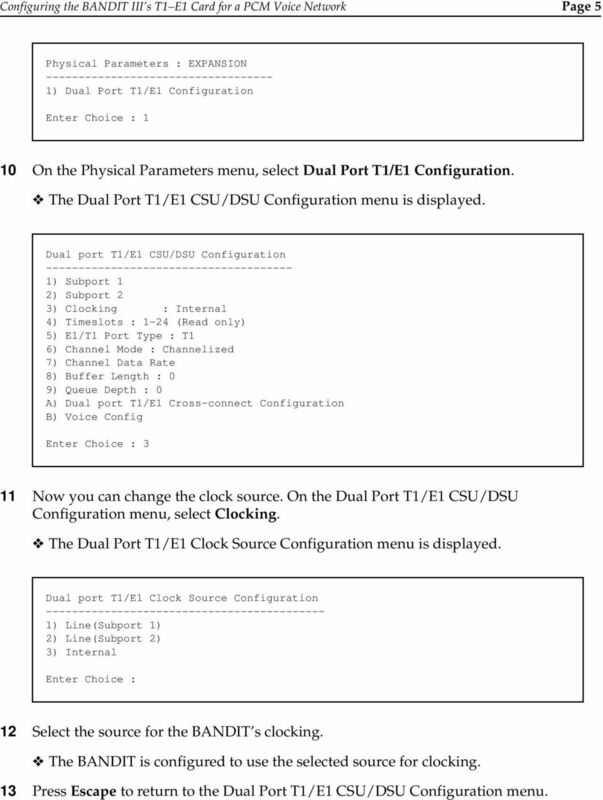 On the Dual Port T1/E1 CSU/DSU Configuration menu, select Clocking. The Dual Port T1/E1 Clock Source Configuration menu is displayed. Dual port T1/E1 Clock Source Configuration ) Line(Subport 1) 2) Line(Subport 2) 3) Internal Enter Choice : 12 Select the source for the BANDIT s clocking. The BANDIT is configured to use the selected source for clocking. 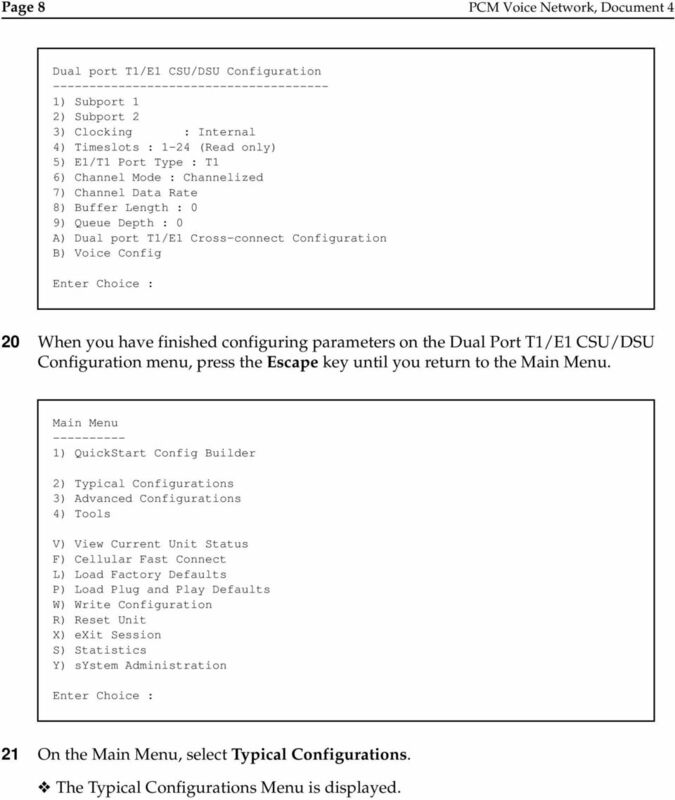 13 Press Escape to return to the Dual Port T1/E1 CSU/DSU Configuration menu. 7 Configuring the BANDIT III s T1 E1 Card for a PCM Voice Network Page 7 17 Verify that all timeslots (timeslots 1 24 for T1, timeslots 0 31 for E1) have CAS signaling enabled. Then press the Escape key until you return to the Dual Port T1/E1 CSU/DSU Configuration menu. Dual port T1/E1 CSU/DSU Configuration ) Subport 1 2) Subport 2 3) Clocking : Internal 4) Timeslots : 1-24 (Read only) 5) E1/T1 Port Type : T1 6) Channel Mode : Channelized 7) Channel Data Rate 8) Buffer Length : 0 9) Queue Depth : 0 A) Dual port T1/E1 Cross-connect Configuration B) Voice Config Enter Choice : B 18 Now, on the Dual Port T1/E1 CSU/DSU Configuration menu, select Voice Config. The Voice Channel Configuration menu is displayed. On this menu, the signaling bits for Idle (onhook) state and Offhook state can be configured. Voice Channel Configuration ) Companding Law : Mu-Law 2) Algorithm : G726/32 3) Idle bits : ) Offhook bits : ) Signaling bits : Transparent Enter Choice : Note: For a T1 line, make sure the companding is set to Mu-Law (µ-law). For an E1 line, use A-Law companding. 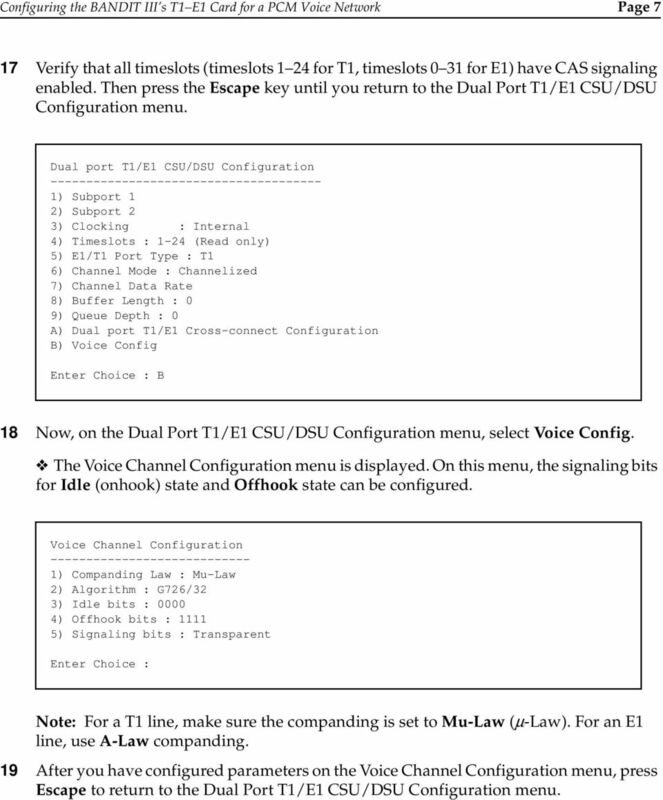 19 After you have configured parameters on the Voice Channel Configuration menu, press Escape to return to the Dual Port T1/E1 CSU/DSU Configuration menu. 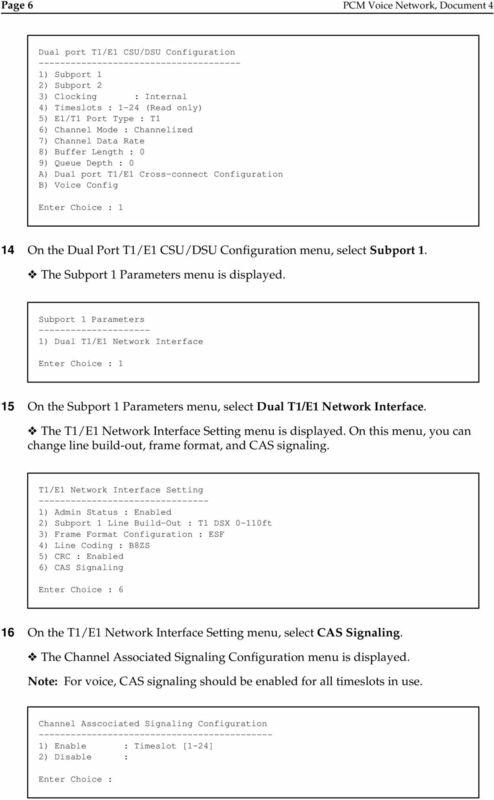 8 Page 8 PCM Voice Network, Document 4 Dual port T1/E1 CSU/DSU Configuration ) Subport 1 2) Subport 2 3) Clocking : Internal 4) Timeslots : 1-24 (Read only) 5) E1/T1 Port Type : T1 6) Channel Mode : Channelized 7) Channel Data Rate 8) Buffer Length : 0 9) Queue Depth : 0 A) Dual port T1/E1 Cross-connect Configuration B) Voice Config Enter Choice : 20 When you have finished configuring parameters on the Dual Port T1/E1 CSU/DSU Configuration menu, press the Escape key until you return to the Main Menu. Main Menu ) QuickStart Config Builder 2) Typical Configurations 3) Advanced Configurations 4) Tools V) View Current Unit Status F) Cellular Fast Connect L) Load Factory Defaults P) Load Plug and Play Defaults W) Write Configuration R) Reset Unit X) exit Session S) Statistics Y) system Administration Enter Choice : 21 On the Main Menu, select Typical Configurations. The Typical Configurations Menu is displayed. 9 Configuring the BANDIT III s T1 E1 Card for a PCM Voice Network Page 9 Typical Configurations Menu ) System Configuration 2) IP Interfaces 3) IP Static Routes 4) VPN Profiles 5) IP/VPN Policies 6) NAT Profiles 7) DNS/DHCP Servers 8) Configure Firewall 9) IP QoS (Quality of Service) A) GPS Geo-Fencing L) LAN : EtherNet No DHCP ETHERNET W) WAN : EtherNet No DHCP ETHERNET M) MODEM : Point-to-Point MODEM INTERNAL S) SERIAL : Frame Relay SERIAL V.24/RS232 DCE E) EXPANSION : PCM EXPANSION EnDual T1/E1 B) RDU/IDU Ports... P) More Ports... Enter Choice : 2 22 On the Typical Configurations Menu, select IP Interfaces. Now you can enter IP address for the LAN or WAN port as shown in the capture. If the IP Interface Table already has records, it is displayed. Go to Step 35. If the IP Interface Table does not yet have any records, the following messages are displayed. 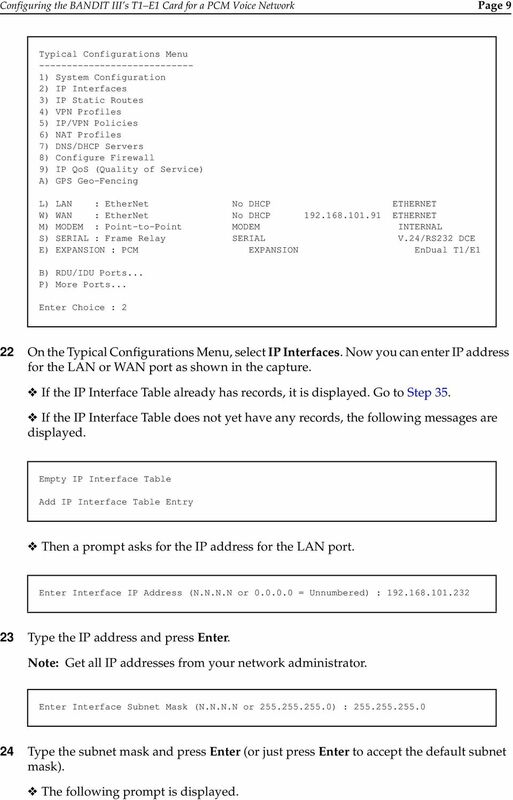 Empty IP Interface Table Add IP Interface Table Entry Then a prompt asks for the IP address for the LAN port. Enter Interface IP Address (N.N.N.N or = Unnumbered) : Type the IP address and press Enter. Note: Get all IP addresses from your network administrator. Enter Interface Subnet Mask (N.N.N.N or ) : Type the subnet mask and press Enter (or just press Enter to accept the default subnet mask). The following prompt is displayed. 11 Configuring the BANDIT III s T1 E1 Card for a PCM Voice Network Page 11 up in fail-over mode, the network provides an IP address to the cellular module. The default IP packets (that is, those not falling within the netmask ranges of the configured interfaces) are then routed over the cellular port. The dynamic IP address is unknown during the time the configuration is being set. To facilitate routing packets over the dynamic IP address (defined by the service provider) during run time, the prompt allows the user to choose the port (for example, Expansion or Cellular) in consideration. 29 Enter the back-up IP address that indicates the type of fail-over back-up you want the BANDIT to use. (If the back-up interface is dynamic for example, if you want the backup to be able to use the cellular wireless connection leave the selection at [None]. The following prompt is displayed. Enter the MTU (256 to 1500) : 30 Enter the Maximum Transmission Unit. The following prompt is displayed. Enable Dynamic MTU adjustment based upon priorities? (y/n), [N]: N 31 Specify whether to allow MTU adjustment. The following prompt is displayed. Enter remote ping address(n.n.n.n, = NONE),[NONE]: 32 Enter the remote ping IP address. The following prompt is displayed. Enable VRRP(Yes/No),[N]? : N 33 Specify whether to use the Virtual Router Redundancy Protocol. The following message indicates that the record has been added to the table. Entry Added Then the system asks for the next entry for the table. 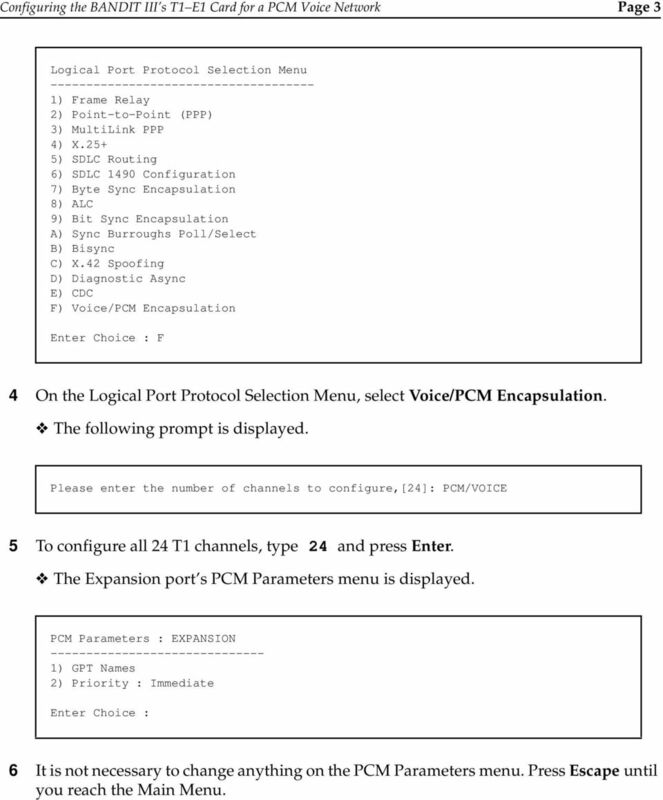 12 Page 12 PCM Voice Network, Document 4 Enter Interface IP Address (N.N.N.N or = Unnumbered) : 34 Do one of the following: a If there is another entry, return to Step 23. b If the table is complete, press the Escape key. The IP Interface Table is displayed. Entry IP Address Net Mask Gpt Name Next Router Mode MTU LAN Off 1500 Add, Modify, or Delete an Entry? 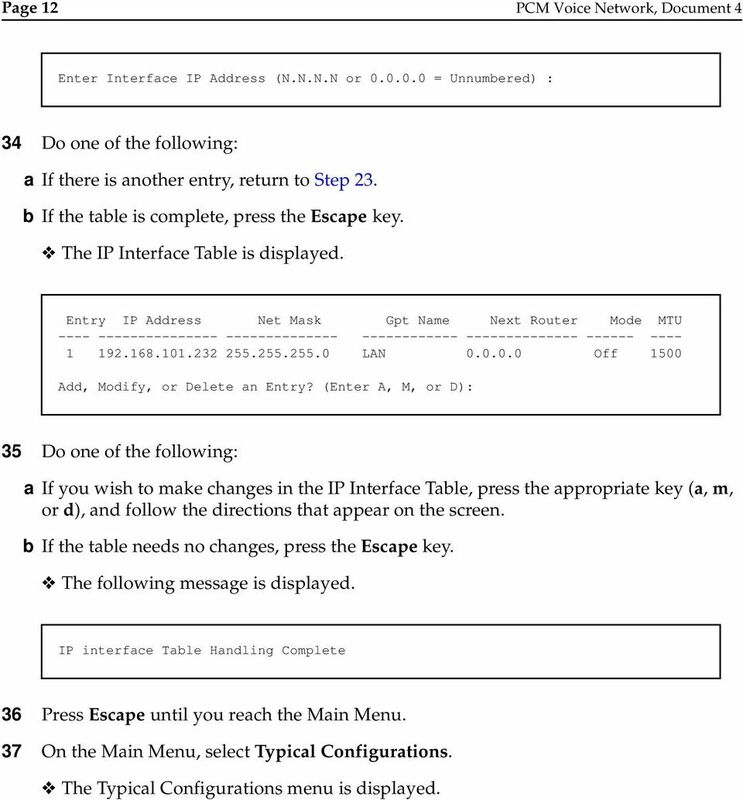 (Enter A, M, or D): 35 Do one of the following: a If you wish to make changes in the IP Interface Table, press the appropriate key (a, m, or d), and follow the directions that appear on the screen. b If the table needs no changes, press the Escape key. The following message is displayed. IP interface Table Handling Complete 36 Press Escape until you reach the Main Menu. 37 On the Main Menu, select Typical Configurations. The Typical Configurations menu is displayed. 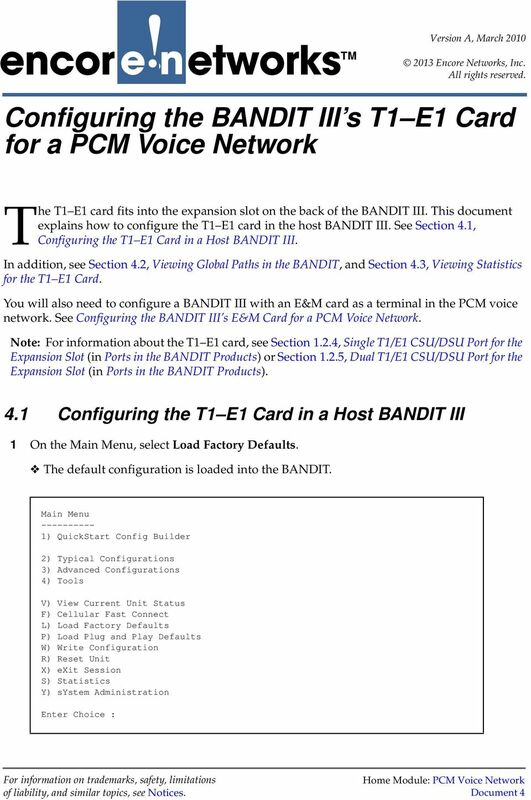 13 Configuring the BANDIT III s T1 E1 Card for a PCM Voice Network Page 13 Typical Configurations Menu ) System Configuration 2) IP Interfaces 3) IP Static Routes 4) VPN Profiles 5) IP/VPN Policies 6) NAT Profiles 7) DNS/DHCP Servers 8) Configure Firewall 9) IP QoS (Quality of Service) A) GPS Geo-Fencing L) LAN : EtherNet No DHCP ETHERNET W) WAN : EtherNet No DHCP ETHERNET M) MODEM : Point-to-Point MODEM INTERNAL S) SERIAL : Frame Relay SERIAL V.24/RS232 DCE E) EXPANSION : PCM EXPANSION EnDual T1/E1 B) RDU/IDU Ports... P) More Ports... 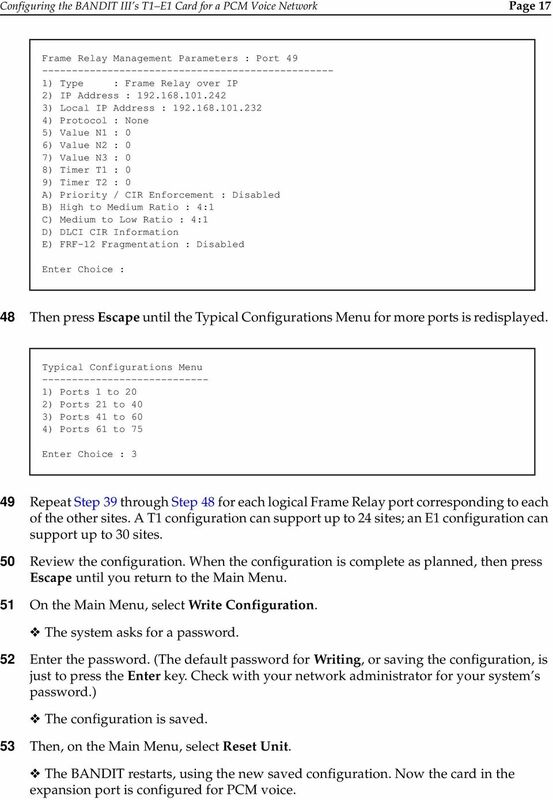 Enter Choice : P 38 On the Typical Configurations menu, select More Ports. The Typical Configurations Menu for more ports is displayed. 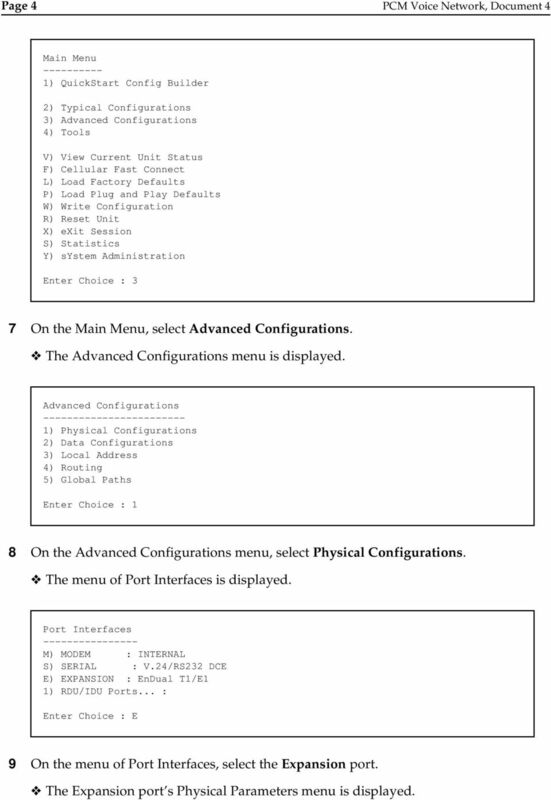 Typical Configurations Menu ) Ports 1 to 20 2) Ports 21 to 40 3) Ports 41 to 60 4) Ports 61 to 75 Enter Choice : 3 39 On the Typical Configurations Menu for more ports, select Ports 41 to 60. 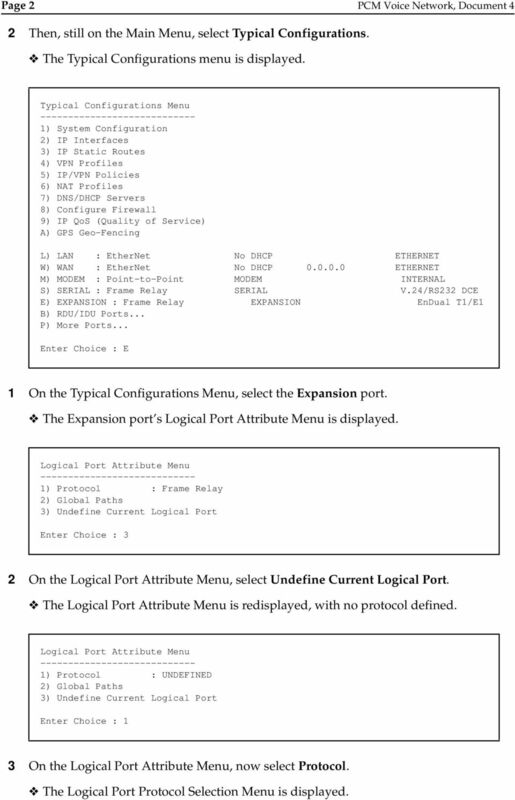 The Logical Port Protocol menu for ports 41 through 60 is displayed. 14 Page 14 PCM Voice Network, Document 4 Logical Port Protocol Mapped To Port Interfaces ) UNDEFINED 42) UNDEFINED 43) UNDEFINED 44) UNDEFINED 45) UNDEFINED 46) UNDEFINED 47) UNDEFINED 48) UNDEFINED 49) Frame Relay Port 49 50) Frame Relay Port 50 51) Frame Relay Port 51 52) Frame Relay Port 52 53) Frame Relay Port 53 54) Frame Relay Port 54 55) Frame Relay Port 55 56) Frame Relay Port 56 57) Frame Relay Port 57 58) Frame Relay Port 58 59) Frame Relay Port 59 60) Frame Relay Port 60 Enter Port : On the Logical Port Protocol menu, select port 49. The port s Logical Port Attribute Menu is displayed. Logical Port Attribute Menu ) Protocol : Frame Relay 2) Global Paths 3) Undefine Current Logical Port Enter Choice : 1 41 On the Logical Port Attribute Menu, select Protocol. The Frame Relay Management Parameters menu for port 49 is displayed. 15 Configuring the BANDIT III s T1 E1 Card for a PCM Voice Network Page 15 Frame Relay Management Parameters : Port ) Type : Frame Relay over IP 2) IP Address : ) Local IP Address : ) Protocol : Adaptive Management - User 5) Value N1 : 6 6) Value N2 : 3 7) Value N3 : 4 8) Timer T1 : 10 9) Timer T2 : 15 A) Priority / CIR Enforcement : Disabled B) High to Medium Ratio : 4:1 C) Medium to Low Ratio : 4:1 D) DLCI CIR Information E) FRF-12 Fragmentation : Disabled Enter Choice : 2 42 On the Frame Relay Management Parameters menu, select IP Address. Enter Destination IP Address (N.N.N.N) : Enter the remote site address for the destination IP address of the GRE Frame Relay port. Note: For each of the 24 remote sites, there is a corresponding logical port, starting from logical port 49. From the network administrator, the user can get the IP addresses of the remote sites. 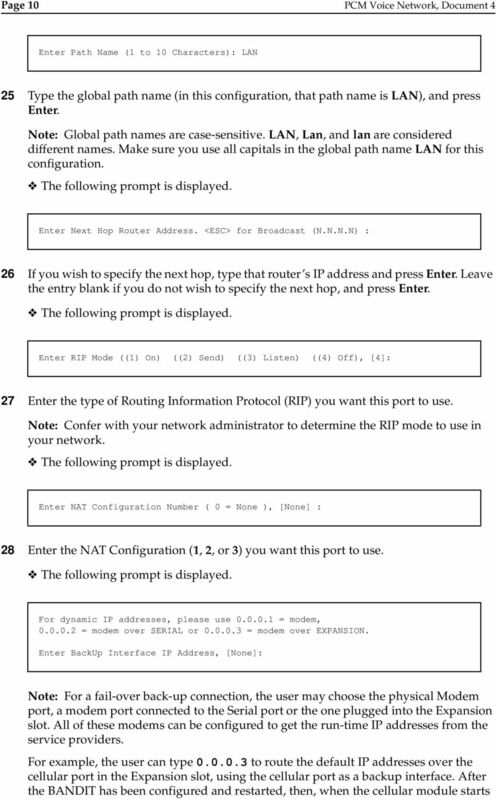 The Frame Relay Management Parameters menu is redisplayed, with the remote IP address listed. Frame Relay Management Parameters : Port ) Type : Frame Relay over IP 2) IP Address : ) Local IP Address : ) Protocol : Adaptive Management - User 5) Value N1 : 6 6) Value N2 : 3 7) Value N3 : 4 8) Timer T1 : 10 9) Timer T2 : 15 A) Priority / CIR Enforcement : Disabled B) High to Medium Ratio : 4:1 C) Medium to Low Ratio : 4:1 D) DLCI CIR Information E) FRF-12 Fragmentation : Disabled Enter Choice : 3 44 On the Frame Relay Management Parameters menu, select Local IP Address. The following prompt is displayed. 16 Page 16 PCM Voice Network, Document 4 Enter Local IP Address (N.N.N.N)( for system to decide) : Type the BANDIT s IP address as the source address and press Enter. 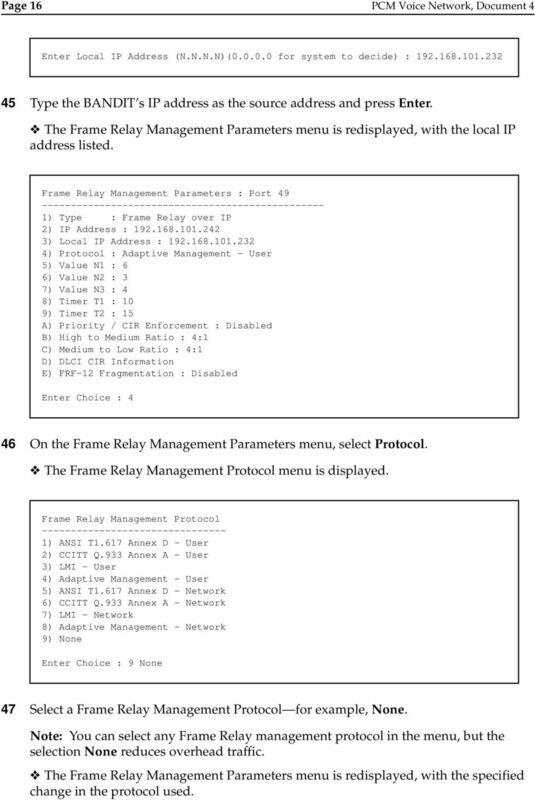 The Frame Relay Management Parameters menu is redisplayed, with the local IP address listed. Frame Relay Management Parameters : Port ) Type : Frame Relay over IP 2) IP Address : ) Local IP Address : ) Protocol : Adaptive Management - User 5) Value N1 : 6 6) Value N2 : 3 7) Value N3 : 4 8) Timer T1 : 10 9) Timer T2 : 15 A) Priority / CIR Enforcement : Disabled B) High to Medium Ratio : 4:1 C) Medium to Low Ratio : 4:1 D) DLCI CIR Information E) FRF-12 Fragmentation : Disabled Enter Choice : 4 46 On the Frame Relay Management Parameters menu, select Protocol. The Frame Relay Management Protocol menu is displayed. Frame Relay Management Protocol ) ANSI T1.617 Annex D - User 2) CCITT Q.933 Annex A - User 3) LMI - User 4) Adaptive Management - User 5) ANSI T1.617 Annex D - Network 6) CCITT Q.933 Annex A - Network 7) LMI - Network 8) Adaptive Management - Network 9) None Enter Choice : 9 None 47 Select a Frame Relay Management Protocol for example, None. Note: You can select any Frame Relay management protocol in the menu, but the selection None reduces overhead traffic. The Frame Relay Management Parameters menu is redisplayed, with the specified change in the protocol used. 17 Configuring the BANDIT III s T1 E1 Card for a PCM Voice Network Page 17 Frame Relay Management Parameters : Port ) Type : Frame Relay over IP 2) IP Address : ) Local IP Address : ) Protocol : None 5) Value N1 : 0 6) Value N2 : 0 7) Value N3 : 0 8) Timer T1 : 0 9) Timer T2 : 0 A) Priority / CIR Enforcement : Disabled B) High to Medium Ratio : 4:1 C) Medium to Low Ratio : 4:1 D) DLCI CIR Information E) FRF-12 Fragmentation : Disabled Enter Choice : 48 Then press Escape until the Typical Configurations Menu for more ports is redisplayed. Typical Configurations Menu ) Ports 1 to 20 2) Ports 21 to 40 3) Ports 41 to 60 4) Ports 61 to 75 Enter Choice : 3 49 Repeat Step 39 through Step 48 for each logical Frame Relay port corresponding to each of the other sites. A T1 configuration can support up to 24 sites; an E1 configuration can support up to 30 sites. 50 Review the configuration. When the configuration is complete as planned, then press Escape until you return to the Main Menu. 51 On the Main Menu, select Write Configuration. The system asks for a password. 52 Enter the password. (The default password for Writing, or saving the configuration, is just to press the Enter key. Check with your network administrator for your system s password.) The configuration is saved. 53 Then, on the Main Menu, select Reset Unit. The BANDIT restarts, using the new saved configuration. Now the card in the expansion port is configured for PCM voice. 18 Page 18 PCM Voice Network, Document Viewing Global Paths in the BANDIT These steps let you review the configuration of the global paths in the BANDIT. 1 On the Main Menu, select Advanced Configurations. Main Menu ) QuickStart Config Builder 2) Typical Configurations 3) Advanced Configurations 4) Tools V) View Current Unit Status F) Cellular Fast Connect L) Load Factory Defaults P) Load Plug and Play Defaults W) Write Configuration R) Reset Unit X) exit Session S) Statistics Y) system Administration Enter Choice : 3 The Advanced Configurations menu is displayed. Advanced Configurations ) Physical Configurations 2) Data Configurations 3) Local Address 4) Routing 5) Global Paths Enter Choice : 5 2 On the Advanced Configurations menu, select Global Paths. The BANDIT s Global Path table is displayed. Note: In this example, 24 paths have been configured for Frame Relay. 19 Configuring the BANDIT III s T1 E1 Card for a PCM Voice Network Page 19 Entry Path Name PathType Port DLCI Port4916 FR PVC Port Port5016 FR PVC Port Port5116 FR PVC Port Port5216 FR PVC Port Port5316 FR PVC Port Port5416 FR PVC Port Port5516 FR PVC Port Port5616 FR PVC Port Port5716 FR PVC Port Port5816 FR PVC Port Port5916 FR PVC Port Port6016 FR PVC Port Port6116 FR PVC Port Port6216 FR PVC Port Port6316 FR PVC Port Port6416 FR PVC Port Port6516 FR PVC Port More... (Press Any Key, ESC to stop displaying paths) 18 Port6616 FR PVC Port Port6716 FR PVC Port Port6816 FR PVC Port Port6916 FR PVC Port Port7016 FR PVC Port Port7116 FR PVC Port Port7216 FR PVC Port Entry Path Name PathType Port LAN PORT TYPE LAN 26 WAN PORT TYPE WAN 27 MODEM PORT TYPE MODEM Add, Modify, or Delete an Entry? (Enter A, M, or D): 3 When you have finished reviewing the BANDIT s paths, press the Escape key. The following message is displayed. Global Path Table Handling Complete 4.3 Viewing Statistics for the T1 E1 Card You can monitor the BANDIT III s statistics while it performs its functions in the network. 1 On the Main Menu, select Statistics. 20 Page 20 PCM Voice Network, Document 4 Main Menu ) QuickStart Config Builder 2) Typical Configurations 3) Advanced Configurations 4) Tools V) View Current Unit Status F) Cellular Fast Connect L) Load Factory Defaults P) Load Plug and Play Defaults W) Write Configuration R) Reset Unit X) exit Session S) Statistics Y) system Administration Enter Choice : S The Statistics menu is displayed. Statistics ) Logical Ports I) IP P) ICMP U) UDP T) TCP L) Loader S) SNMP B) BANDIT Triggers 2) Alarms C) LLC W) SNA Switching Q) QLLC O) MODEM V) VPN Statistics G) GPS Status Z) Clear All Statistics D) Display All Statistics A) Dump All Statistics Enter Choice : 1 2 On the Statistics menu, select Logical Ports. 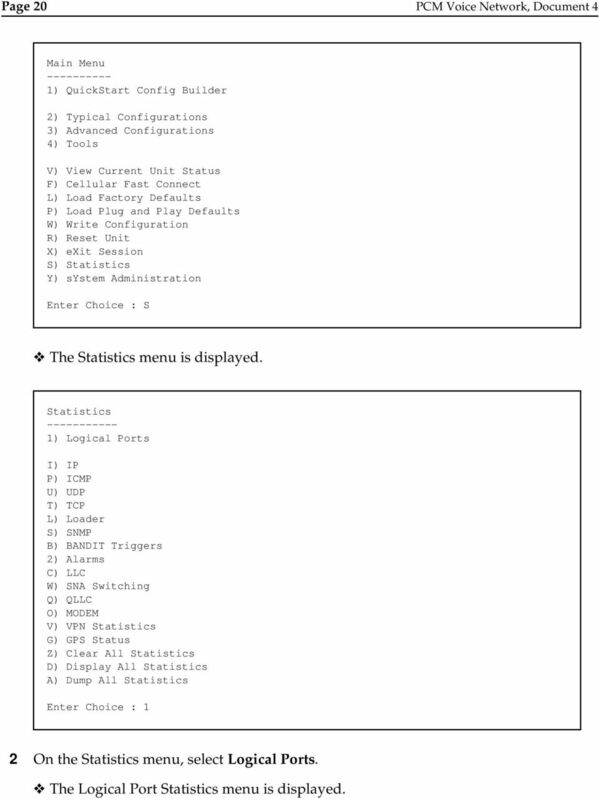 The Logical Port Statistics menu is displayed. encor! enetworks TM Version A, March 2010 2013 Encore Networks, Inc. All rights reserved. Using the Syslog Feature This document provides basic information for using the syslog feature in the ELIOS software. his document discusses implementation of dynamic mobile network routing (DMNR) in the EN-4000. The following sections describe the Gateway configuration pages in the SBG1000 Setup Program. This page displays the device information, such as Product type, Device ID, Hardware version, and Software version. How To. Configure E1 links. Introduction. What information will you find in this document? Configuration Quickstart Backing Up a Broadband Connection with Dialup Introduction Broadband network service is becoming a desirable alternative to dialup or leased line service for access to remote networks.